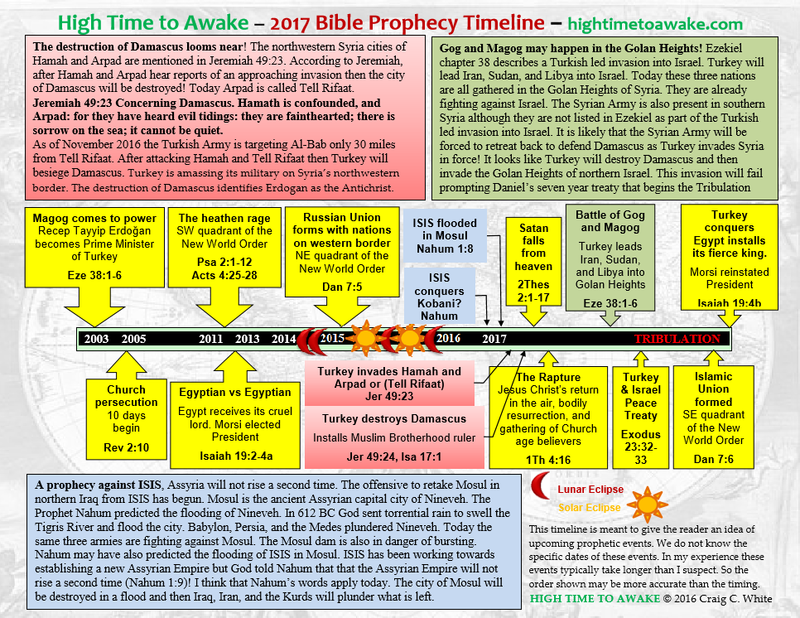 The 2017 Bible Prophecy Timeline looks a lot like the 2016 Bible Prophecy Timeline. There is one profound difference. It is apparent that so many of these events are just about to happen. I don’t know which one will begin first. Let’s start with the flooding of ISIS in Mosul. The Prophet Nahum predicted the flooding of the ancient Assyrian capital city of Nineveh. Today Nineveh is called Mosul in northern Iraq. Nineveh flooded in 612 BC. Then the Babylonians, Persians, and Medes ransacked the city until nothing was left. The flooding of Nineveh put an end to the Assyrian Empire. God told Nahum that the Assyrian Empire will not rise a second time. Today ISIS is trying to establish a new Assyrian Empire. ISIS is headquartered in Mosul (or Nineveh). The same three nations that overthrew Nineveh are fighting against ISIS in Mosul. The Mosul dam is in danger of bursting. It could be that Nahum also predicted the flooding of ISIS in Mosul! The battle to retake Mosul has already begun. The flooding of Mosul could happen any day! The flooding of Mosul could be the end time sign that Jesus is Israel’s true Messiah, and that Israel’s time of trouble is about to begin. Jeremiah 49:23-27 describes an invasion into northwestern Syria and the following destruction of Damascus. Jeremiah 49:23 mentions two cities in northwestern Syria. They are Hamah and Arpad. Today Arpad is called Tell Rifaat. The Turkish Army has already entered Syria at its northwestern border. As of November 2016 the Turkish Army is 30 miles away from Tell-Rifaat. Also some 50,000 Turkish troops are amassed on Syria’s northwestern border. Turkey President Erdogan has pledged to remove Syria President Assad from power in Damascus. Remember that the destruction of Damascus begins with an attack on Hamah and Tell Rifaat. It looks like this could happen any day! 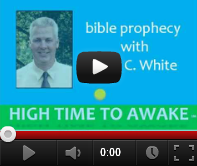 There is another Bible prophecy that is already forming. Ezekiel chapter 38 describes Turkey as they lead Iran, Libya, and Sudan into Israel. These last three nations are already gathered in the Golan Heights of Syria. Turkey will launch a large scale attack on northwestern Syria and then destroy Damascus. Afterward Turkey will lead the forces that are fighting in southern Syria into the Golan Heights of Israel. The fact that Iran, Libya, and Sudan are already gathered in southern Syria makes me believe that all of these events will happen relatively quickly. 2nd Thessalonians chapter 2 tells us that two events must happen before the seven year long Tribulation period begins. These two events are the falling of Satan from heaven to Earth and then the empowering of the Antichrist by Satan. I wonder if the falling of Satan will be an event that the world will recognize. Jesus said “I beheld Satan as lightning fall from heaven”. I wonder if the fall of Satan will be a visually spectacular event. It is possible that we will recognize the falling away of Satan by the signs and wonders that help to identify the Antichrist. By the way Turkey President Erdogan is fulfilling many of these prophecies. Erdogan is the Antichrist. The Rapture of the Church is designed to rescue Christians from the terrible time of trouble that is coming upon the world. Up until now Satan has been in heaven accusing Christians of sinning. Revelation 12:7-12 says that there will be a war in heaven and that Satan will be cast out. I think that Satan will be cast out of heaven to Earth and then the Antichrist will perform false miracles. Then Jesus Christ will come to save Christian believers. I expect the fall of Satan and the Rapture of the Church to happen soon; maybe even this year. There are three battles in the Bible called “Gog and Magog”. They are described in Ezekiel chapter 38, Ezekiel chapter 39, and Revelation 20:8. In all three battles Turkey leads the nations of the old world into Israel. In all three battles Satan empowers a Turkish ruler. The first battle of Gog and Magog is described in Ezekiel chapter 38. I think that this is the Turkish led invasion into the Golan Heights that is already gathering today. This invasion will fail. The second battle of Gog and Magog is described in Ezekiel chapter 39. This is the same as the battle of Armageddon that happens at the end of the Tribulation period. The third battle of Gog and Magog will happen at the end of the one thousand year reign of Jesus Christ in Jerusalem. Satan will be released from prison for a short time and will once again lead the nations against Israel. Satan seems to be the instigator of the Turkish led invasions into Israel. This leads me to believe that Satan will fall from heaven before Turkey leads Iran, Libya, and Sudan into the Golan Heights of Israel. Remember that these nations are already fighting in the Golan Heights of Syria. If the Resurrection and Rapture of Church age believers happen after the fall of Satan then we are very near to that day! 2017 is poised to bring Bible prophecy to pass. We are all very close to the Resurrection, Rapture, and the Tribulation. Read my book 2017 The Year of Fulfillment before you meet Jesus. Hi Craig. I’ve been taking a Facebook break, but I plan on buying your new book. I still refer to the ones I previously bought. I have two questions for you. First, since Erdogan will probably increase his power in the coming Turkish referendum, and given how he praised the recent U.S. military strike on Syria, do you think he’ll use this as a pretext to launch his invasion? Second, have you heard or considered the major astronomical event slated to happen on September 23, 2017? Many internet/you tube preachers/teachers claim it could possibly coincide with Rosh Hashanah/the Feast of Trumpets and could signal the rapture. Hi Brian. It’s nice hearing from you. Before Trump bombed Syria, Turkish President Erdogan announced that Turkey has plans to further attack Syria this spring. He specifically targeted the Kurdish areas of Hamah and Tell Rifaat. After the missle attack on the Syrian airbase Erdogan said that more needs to be done. If Erdogan gets more power on Sunday then I expect that new Turkish incursions into Syria will follow soon thereafter. I am reminded of the Bible verse that says that when Satan falls from heaven to earth that he will have great fury because he knows that his time is short. It could be that when these things begin that they will happen quickly. That means that the invasion of northwestern Syria and the destruction of Damascus and the following Turkish led invasion into northern Israel could happen quickly. PS: There may be something to the celestial signs but I don’t follow them. Wasn’t Satan already cast from heaven and sent to earth before Adam and eve? How could he be cssf crom heaven a secsec time?